I've been at my computer for a couple of hours writing my usual weekly post (about slaying our imaginary dragons by the way). It's been more of a 'battle' than usual and I can't get it to a place where I feel OK to post it. I have a draft, I know what I want to say, but I haven't nailed the words in quite the way I want. 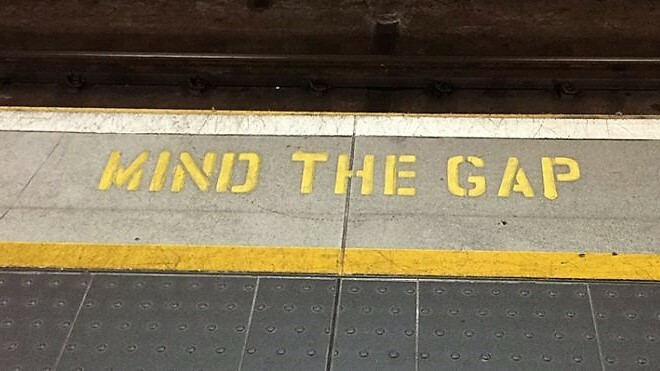 As soon as I did that, I saw an opportunity to write about 'the gap' I often see with clients (and in myself). The 'gap' that creates all our discomfort, the 'gap' that we think is the barrier to getting what we want, and the 'gap' that, to many of us, feels like the thing we have to 'tackle' before we can put our focus on achieving our goals. Ah, how wrong we are. When I first bring up the idea of a 'gap' it's possible your mind goes to somewhere in the future—something you think you're moving towards? In fact you'll often hear coaches tell you that's what they do—"help their clients close the gap between where they are and where they want to be." I see it differently, though; I see that the gap isn't really a gap. It's illusory, and therefore seeing through the illusion is more important than 'doing' anything about it. When it comes to my writing—like today—sometimes I'm not in the place I assumed I'd be. The post I thought I was writing is still in draft. At one point this morning I wasn't even sure I'd post anything! I say to myself. I am an observer in what is happening, I am not 'in control' of how things unfold. There is no 'gap' (for me) in this scenario; I'm not experiencing the place I find myself as anything other than kinda interesting. It doesn't matter that I haven't written the book, I'm totally content to be moving towards it and yet not know where I will end up; I have no attachment to this post versus the post I thought I was writing... what is is simply what is. There is no pain or discomfort because I don't feel as if I need to be anywhere other than where I am. AND, still, there is a direction to look—the direction of my next book. However... there are other places in my life where it feels, in a very real way, as if there is a gap between 'where I am' and 'where I think I should be'. Meaning, it feels as if it 'isn't OK' to be where I find myself. Imagine, for example (well there is no need to imagine, because it's a real example! ), that, right now, I'm not as fit as I want to be (or have been in the past). I find myself dissatisfied with my body, my level of fitness, my lack of stretchiness in yoga, my unwillingness to go out for a run. I look back to a rosy past and compare myself to the younger Cathy, or I look forward, creating an imagined life of misery and inactivity. What I'm doing here is feeling the mental anguish that comes from not seeing that all of this is an illusion. An illusion that looks (sometimes) as if my present situation is not OK.
To an outsider (a fitness trainer perhaps) it could look as if my dissatisfaction is coming from my desire to be somewhere else, and therefore we could work with that to drive a change in my behaviour. A 'burn your bridges' approach; the worse things get the more motivation I have to do something about it. Sorry, but no, that's not how things work. What's happening for me in this example is simply that I do not see the illusion. The 'gap' looks real. But how can it be? I cannot be other than where I am? If I want to look towards a place of being more fit, to get back into my running, or find an alternative, more long-distance walking and cycling, maybe indoor climbing (my boys love this, why can't I have a go too?! ), etc etc, then I can do that. The more it looks to me as if this 'gap' between my present reality and my imagined present reality is real, however, the more difficult it is to create that in my life. I'm looking at the illusion, not the beautiful unfolding of life. The problem is never in the future. It isn't somewhere to 'get' to. The gap between where we are and where we want to be is never the problem. It's the gap between 'where we are' and 'where we think we should be right now' that is draining us of mental energy, that is taking our focus away from doing what we want, from being fully connected with the person in front of us, from showing up as our best self, from doing the work that needs to be done. The more clearly we see that the gap is an illusion, that it only looks real because we create it as real, the better we are able to move forwards on the path we are guided to take. The more clearly we can see the complete irrelevance of where we are, the more things will begin to shift. After all, where we are is always perfect.